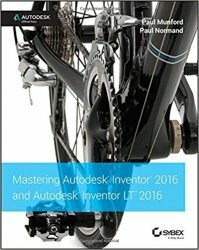 Mastering Autodesk Inventor 2016 and Autodesk Inventor LT 2016 is a complete real-world reference and tutorial for those learning this mechanical design software. With straightforward explanations and practical tutorials, this guide brings you up to speed with Inventor in the context of real-world workflows and environments. You'll begin designing right away as you become acquainted with the interface and conventions, and then move into more complex projects as you learn sketching, modeling, assemblies, weldment design, functional design, documentation, visualization, simulation and analysis, and much more. Detailed discussions are reinforced with step-by-step tutorials, and the companion website provides downloadable project files that allow you to compare your work to the pros. Whether you're teaching yourself, teaching a class, or preparing for the Inventor certification exam, this is the guide you need to quickly gain confidence and real-world ability. Inventor's 2D and 3D design features integrate with process automation tools to help manufacturers create, manage, and share data. This detailed guide shows you the ins and outs of all aspects of the program, so you can jump right in and start designing with confidence.